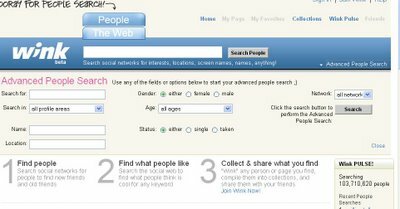 Potential stalkers out there will rejoice at Wink's People Search feature, which indexes profiles from MySpace, Bebo, and LinkedIn. Stalkees who quit one service to escape to another can no longer hide quite so easily. Searches can be narrowed down by age, gender, location, network, and relationship status. But, seriously, Wink is really diversifying by going into the social networking search market. About a month ago, I asked when the first attempt to aggregate social networking profiles would occur, and Wink's effort goes a long way towards that goal. 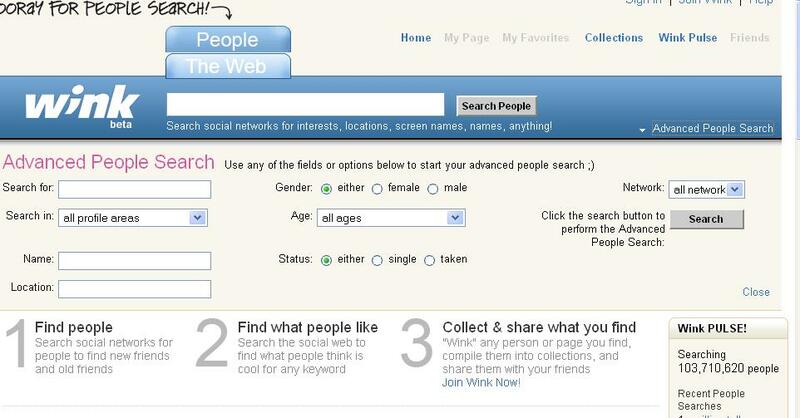 For instance, a prospective network could use Wink's People Search engine to identify users' profiles across three different social networks and bring them together into one common interface. Users could then post to all the different networks they are a part of and keep track of comments and shoutouts easily from one page (a sort of social networking portal if you will). Interestingly, Wink indicates that it is searching 103,710,620 people, but how can it tell that it's not double- (even triple-) counting? I think the potential here is huge, especially with the splintering of users into various niche social networks. Of course, one of the reasons for that is that users want to segregate their social networking ties. They want to keep their MySpace network contained to MySpace, and their Facebook friends on Facebook. So this development won't be welcomed by many users. One solution is to have a sort of robots.txt file that users can put on their profiles so Wink and future competitors will know to ignore them. Great perspective! You're right on the money.